Why does the geodetic community need GeodesyML? Is GeodesyML aligned with international standards? 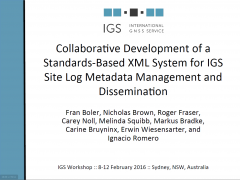 What is an XML-based standard? Are there alternatives to GeodesyML? What does GeodesyML look like? What are the benefits of using GeodesyML for Data Managers? How do I implement GeodesyML? Why use GeodesyML instead of a custom namespace? Do you have any presentations that I can use internally to promote GeodesyML to my Senior Leadership? What technical support is available to help our IT specialists implement GeodesyML? Standards like those provided by International Organization for Standardization (ISO) provide a structure (or a standard way) to define and store ( or encode) important information about data. Standardising the way in which data is described and stored makes it much easier to discover, share and integrate. 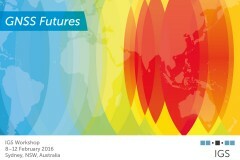 There are a range of standards that apply to geospatial data and metadata. This blog post aims to describe how GeodesyML (a proposed geodesy standard) fits in with international standards and why it is required. items like a filing cabinet and spice rack to keep things neat and tidy. GeodesyML is a spice rack. Let me explain. Some standards provide a structure for fundamental metadata, like where the data is, the date it was captured, overview of the content, quality of the data, description of the appropriate use and a point of contact. This is metadata which is needed for almost all geospatial data. Hence, it is the foundation in our house. 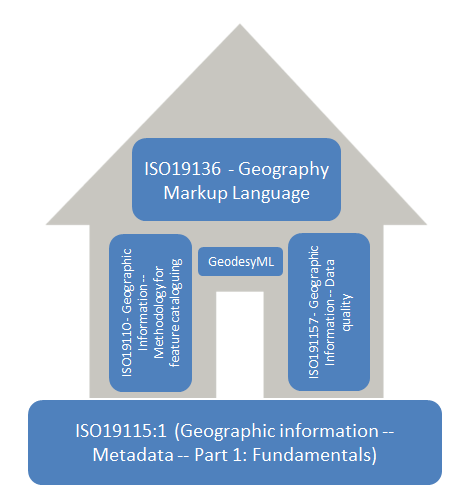 In the world of the ISO, this is akin to ISO19115-1:2014 (Geographic information — Metadata — Part 1: Fundamentals). The next type of standards are those that either provide structure for details about specific types of data (e.g. points, raster etc) or define the structure of how data is stored (encoded) and transferred to make data sharing more efficient. As described above, the foundation standards store general information about the data set but not specific information about each piece of data in it. This detail is dealt with by myriad standards which are specific to the type of data. For example, ISO 19110:2005 (Geographic Information — Methodology for feature cataloguing) and ISO 19157:2013 (Geographic Information — Data quality) are used to capture more specific information about features and the quality of the data than that covered in ISO19115-1:2014. They provide the internal structure, akin to the walls and roof of a house. The other type of functional standards are those which allow us to do things more efficiently. Two prominent examples are the Geography Markup Language (ISO19136:2007) and the Web Feature Service (ISO 19142:2010). In brief, these two standards provide a structure to store and transfer data and metadata efficiently at a machine to machine level. This is like the electricity in your house; you flick the switch and things move to give you light and power, or in our case, metadata. As covered above, standards like ISO19115 provide foundation metadata while standards such as ISO19110 and ISO19136 (GML) provide details about features and assist with the efficient transfer of this metadata. 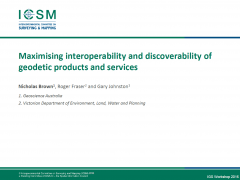 However, of all the standards currently available, none are available (until GeodesyML) that handle geodetic data specifically. GML (ISO19136) can provide details about features (time, dates …), but GeodesyML providing specific details about the geodetic properties of the features (antenna, receiver). Hence, GeodesyML is the spice rack providing specific details to keep your geodetic data and metadata neat and tidy. It is also structured in such a way that it is compatible with GML to allow to efficient machine to machine transfer of geodetic data and metadata. I hope this helps to explain how GeodesyML fits in with international standards, but if you have any questions or would like clarification on anything, please contact feel free to get in touch using the information at the bottom of this page.